Baltimore native Michael Britt has been accompanying silent films at the Weinberg Center for almost a decade. Britt started at the Weinberg to assist longtime organist Ray Brubacher. Britt, now sixty-three, recalls visiting the Tivoli Theater (now the Weinberg Center) where Brubacher masterfully improvised accompaniments at the helm of the Mighty Wurlitzer. Due to health reasons, Britt took over for Brubacher for part of the 2012-2013 season, but Brubacher returned after recovering. The next year, Brubacher fell ill and soon after passed away, leaving Britt to fill the shoes of his longtime mentor, inspiration, and friend. Growing up in a family of musicians, it is no surprise that Britt started early, beginning church organ lessons at the age of eight. 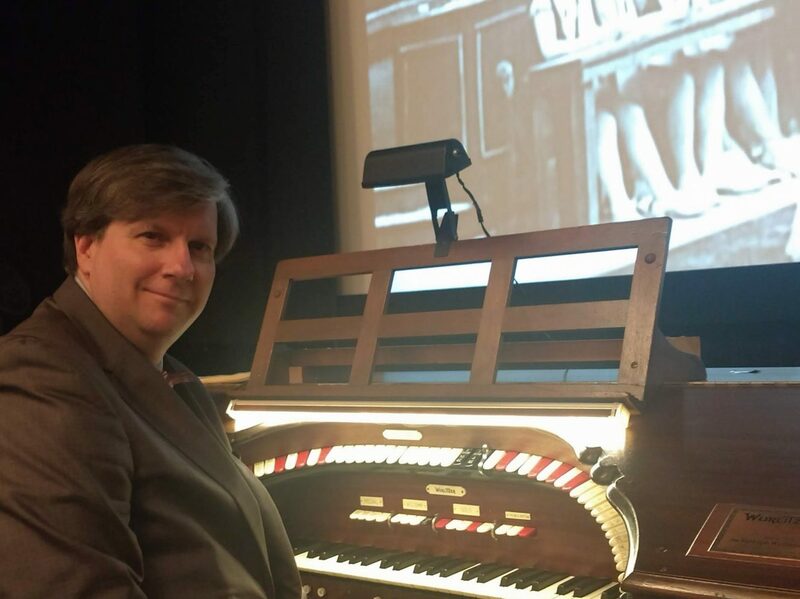 Britt’s grandmother, great grandfather, and great uncle were all organists, playing in churches and theaters. However, Britt did not originally plan on becoming a theater organist. One day, Britt read a newspaper article about a man from Thurmont named Richard Kline who had a theater organ in his house. Intrigued, Britt sent Kline a letter, hoping to learn more about the organ. To Britt’s delight, Kline replied, inviting Britt and his parents to his home for a concert. After visiting Kline, young Britt was hooked, “That’s what I want to do,” he thought. While in the seventh grade, Britt volunteered to accompany “The Thief of Baghdad” for his class. “You can do that?” his teacher asked. “Probably not, but I’m going to try anyway,” Britt joked. At the age of fifteen, Britt began screening silent films at a local church as he practiced accompaniments on the church’s organ. “I was just so driven,” said Britt, who always looked forward to Tivoli visits, where he often found inspiration for future performances. While working with Brubacher, the “foremost silent film accompanist” in the region, Britt could not convince Brubacher to give him private lessons. Brubacher insisted that Britt did not need lessons, only pointers.